I was waiting for an appointment one summer afternoon, just minding my own business, listening to some Classical music playing in the background, when I was interrupted by a fellow patient exclaiming something along the lines of: “Why do they play this crap at the doctor’s office?” That comment irked me a little, but I shrugged it off, because hey, everybody is entitled to their own musical opinions. Similarly enough, I have also heard people dissing anything that is less than Classical. In both these situations above (and in others I have encountered), the people appeared to be displaying something called musical elitism. Recently, I brought up the above idea of authenticity in music in a class discussion of sorts, to which our professor replied that authenticity is a statement of relationship, and is shaped by our identity. Based on their comment and what followed, the patient most likely grew up listening to rock music (and may have even been part of a rock band in their youth – who knows? ), just like how others may have been classically trained their entire lives and as a result, have developed an affinity for Classical music. 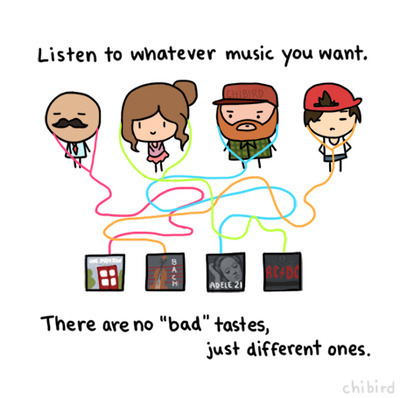 Both genres are authentic, relative to each person’s musical encounters and lifestyles. All music is authentic. All musical opinions and preferences are valid. All music deserves to be given a chance. Why is musical elitism even a thing?